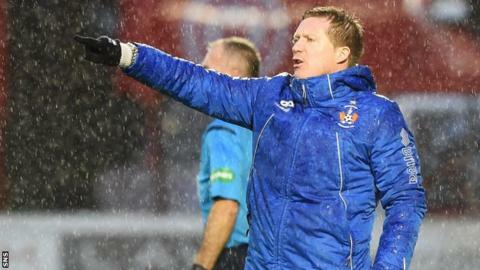 The Kilmarnock manager Gary Locke says the 1-0 victory over Hamilton Academical was down to his players knuckling down after recent disappointing defeats. A goal from Tope Obadeyi earned Kilmarnock their first victory in more than two months. The result moves Kilmarnock 10 points clear of Dundee United and eases some of the pressure on Locke. "We need to win football matches and keep yourself in jobs," he said. The Kilmarnock boss was delighted with all three points, especially on the back of last week's hammering at home to Aberdeen. He said: "It meant a lot. Obviously it has been a difficult week for us especially after last week, but I thought the boys did great. We moved the ball and created numerous chances." Scorn has been poured on the Kilmarnock defence after recent poor showings which had left them without a win since a 2-1 success over Dundee at Dens Park on 24 October. "We have defended well in certain games but not others," Locke told BBC Scotland. "We have worked hard on the training pitch this week because there was so much wrong with the defensive performance last week we didn't know where to start. But the boys have knuckled down, they've worked hard and they have responded today. "I'm delighted for our supporters. I'm well aware we have been very inconsistent and we said to the players we need to find a level of consistency." This was a first ever win for Kilmarnock at New Douglas Park, after a week in which Locke acknowledged boardroom concerns over recent performances. "I'm well aware of the situation. It's frustrating because I know the players are so much better than they have shown," he added. In contrast it was another frustrating day for the Hamilton player-manager Martin Canning. "On another day I think we could be three or four [goals] up," a frustrated Canning said after the match. "We're struggling to put the ball in the net and we're conceding soft goals. I think the goal they scored just typifies it - he's hit the ball into the ground and it has bounced up over Michael McGovern. He could try that another 20 times and it would never go into the net. "We have had two cleared off the line, three or four really good opportunities and we don't take them and we've been punished." Hamilton have now managed only one victory in their last 10 matches, and Canning concedes the poor form is a cause for concern. He said: "It's results that count. I can keep on saying we are performing well - and today I don't think we deserved to lose the game - but you have to get results. "Ironically the worst performance we had was Dundee United up there, and it's the game we won. So that's football. It's just frustrating when you can't put your finger on it."